Uglyworld #451 - Ice-Bat's Stunt Challenge (104-365), originally uploaded by www.bazpics.com. This morning as myself and Mireille were leaving for work Ice-Bat asked us if it was ok for him to stay outside all day while we were away. Naturally we wouldn't agree without finding out his reason for asking, and after a little delay he told us that he has been challenged by Jeero to fly over the top of one of the apartment complexes in Aachen and down the other side. At first I looked up and saw that it was almost 20 stories high and then looked at Ice-Bat inquisitively, Mireille however was a little more positive in her response, "Do you think you can make it, and more importantly, can you do it safely?". 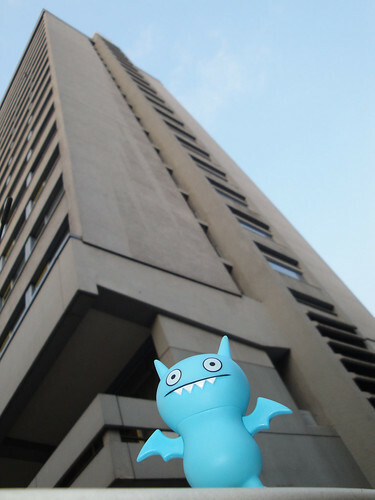 Ice-Bat nodded his head eagerly in excitement and with that I told him if he could prove to us that he could make it to the 10th floor while we watched that we would agree to let him stay outside and practice. Sure enough the little guy went upwards and upwards as fast as his wings could carry him, and once he reached the 10th floor he hovered for a few seconds before doing a supersonic skydive back towards us and then finally landing a couple of metres from us with the style and grace of a figure skater landing a triple salco (blindfolded). There was nothing else to say, the little guy had proved his skills and so we left him to practice the full building while we both went off to work.